Hello, and thank you for visiting this page! I will keep the introduction here short and sweet – I’ve put this together to showcase all of the tools, software, and equipment I use to run my businesses. The goal here is that as I discuss each thing and what it’s used for, you’ll find a few that you could benefit from as well. For each purchase, I’ve spent a good amount of time comparing each of these to their competitors, and decided that these choices were the best fit for me. However, that does not mean they will be best fit for every business, and your mileage may vary. Important note – many of the links on this page will be affiliate links. This means that I may earn a small commission for referring you to the company if you go on to buy. This costs you nothing extra, and just tells the website that I’m the one that referred you. Unlike many others, I don’t choose products based on what one will make me the most money promoting it. Rest assured knowing that I actually use and recommend all of the products mentioned in this document. Finally, if you have any questions about anything mentioned in here, please don’t hesitate to reach out. You’re always welcome to send me an email at james@jamesmcallisteronline.com, and I’ll always try my best to get back to you as soon as possible. Let’s start with the things I actually use to power my websites. Most of my websites are currently running off of one of Hostgator’s dedicated servers. As none of my websites individually use enough to require a server on their own, most of my companies’ websites run off of this same dedicated server. It’s important to keep in mind that most people won’t require a dedicated server, especially if they are only running one website. One of Hostgator’s shared hosting plans is more than suitable for most people, at least for a while. If you’re interested in something a bit more powerful, I’ve used and recommend WPEngine. It’s arguably the best hosting for somebody running a WordPress site, which is what I recommend using unless you have another reason not to. It’s a bit more expensive per month though, coming in at $35 a month for their first plan. Still, this comes with a Genesis theme (which I use and recommend below) a bulit in CDN (which will speed up your site) and they’re quite accommodating of sudden traffic surges, which is important when articles gain any sort of virality. Hostgator’s shared plans on the other hand will simply shut down your site until the traffic dies down – they have to do this to protect all of the other people also using that same shared server. Still, it can be a decent option starting out. Just be prepared to move to something bigger later on if you start out with a shared plan! Click here to view Hostgator! Click here to view WPEngine! My domain names are typically registered through GoDaddy. This isn’t for any particular reason, they’ve just been what I’ve used since the beginning, and I haven’t ever had any problems, or any reason to switch. Updating any of the information regarding the domain has always been easy and because it’s so popular, there are a lot of guides available when you actually need to make any sort of changes. Visit GoDaddy by clicking here! I’m terrible at naming things, and have had times had to consult a company that aids with this. Ink and Key is now my go-to, I’ve had nothing but pleasant experiences with them. That being said, the only competitor of theirs that I’ve used is Squadhelp. My experience with Squadhelp was unfortunately quite terrible, despite paying for their largest package. My only note about Ink And Key you should be aware of is that it will require quite a bit of back and forth – giving feedback on suggestions you like, and what should be changed. Still, I’ve always got names and taglines that I’ve been happy with. Visit Ink and Key by clicking here! The WordPress CMS is what I use to power almost all of my websites. This makes it incredibly easy to build a nice looking site, add and edit content with ease, and take care of pretty much everything else under-the-hood – all while making it easy to add on additional functionality in a safe and secure manner. Even the least technical people can operate WordPress with ease, and there is very little reason not to use it for most people. Visit WordPress.org by clicking here! As for WordPress themes, most of my sites are powered by themes running on the Genesis framework, an offering by the company ‘StudioPress’. I use these themes because they are easy to work with and extend upon, they’re very lightweight (meaning they load quicker), they’re mobile-responsive, and highly customizable. Currently, JamesMcAllisterOnline.com is running the ‘Generate Pro’ theme. The old version of the site, HelpStartMySite.com, was running the ‘News Pro’ theme. All this being said, these are paid themes, although I’ve found the investment to be worth it. Still, if you’re just starting out, don’t get too hung up on design – the content you produce matters far more. Click here to view StudioPress themes! All paid content on my site is managed through MemberPress, which uses Stripe as a payment processor. MemberPress handles all aspects of creating and gating paid areas, so only people with access can actually view the pages. Additionally, there are plenty of additional features that make it a wonderful option for hosting paid products, such as a buyer’s dashboard, account setup, automatic email notifications, a comprehensive analytics dashboard, and more. Additionally, the top tier of MemberPress comes with an affiliate program plugin called Affiliate Royale, which I use to power my affiliate program. It covers just about everything you’d want an affiliate program plugin, and I’ve never had any problems with it. Click here to read my full review on MemberPress and Affiliate Royale! Click here to view MemberPress! Additionally, I use a few other plugins to power my WordPress site. All of these below are free, with the exception of Commentluv Premium. A given, as it helps with much of the on-page SEO for my content. To further protect my website, Wordfence improves security further. Allows commenters to share links to their newest articles, as well as their Twitter handle. Unfortunately, it looks like this is no longer being supported by its developer. Regularly posts articles from my blog’s archives to my Twitter page. Settings can be customized to your liking, and it’s free! For making nicer looking outbound links. 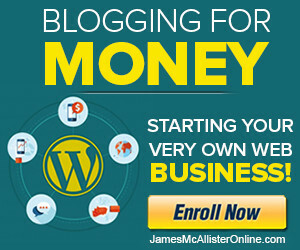 For example, https://jamesmcallisteronline.com/go/getresponse instead of some huge, long, affiliate link. Displays related posts after each blog article I publish. Great for reducing bounce rate and improving engagement! Caches your page so they load much faster for visitors. If you don’t know what caching is, I highly recommend reading about it and how you can benefit from caching. P.S: I talk heavily about caching (and other site speed improvement methods) in my blogging course! For my eCommerce stores, I utilize Shopify as my primary system. For most people, it’s simply the best option – getting a store up and running, as well as managing it, is really quite simple. There are also a lot of plugins to extend functionality. Larger stores may benefit from a system that is easier to extend upon, as I’m told Shopify isn’t the easiest for software developers to work with. However, for most people, it will work just fine. Click here to view Shopify! That about covers everything regarding the core of my websites, although there are specific plugins and software I did not list above. In the next section, let’s look over marketing tools I use to build traffic and awareness, as well as tools I use to help with making sales! GetResponse is arguably the most important marketing tool that exists for my businesses, because they manage all of my email lists. I utilize my email lists to move prospective buyers deeper down my sales funnel, providing value to them and building trust over time in a personalized way, which I’m not able to do quite as effectively through my website alone. A very large percentage of my buyers do so after opening a targeted email from me. GetResponse allows you to set up autoresponders – series of emails that occur at specified intervals (such as 7 days after a person opts-in to a list, for example), as well as allowing you to segment subscribers into specific categories, and send emails to all of them at once. Needless to say, it’s pretty powerful, and everyone should be building their email list from the very beginning. GetResponse does have one major competitor, Aweber, and I reviewed both of them in a post on my site, which you can view my clicking here. Click here to learn more about GetResponse! All of the social sharing buttons are powered by a plugin I use called Easy Social Share Buttons. This includes both the share buttons used at the end of each post, and the follower counts displayed on my website’s sidebar. Additionally, the ‘click to tweet’ boxes that appear within certain articles are powered by this plugin as well. It’s pretty powerful! With tons of customization to both functionality and design, as well as a nice analytics dashboard, I found it to be the best option out of everything I’ve tried so far. It is a paid plugin, coming in at $20, but in my opinion is money well spent! Click here to view Easy Social Share Buttons! I run banner display ads on my site for many of my products, and many of these ads are displayed through a plugin called Advanced Ads Pro. It has far more options than I currently utilize, and I highly recommend checking out their website for a full list of all of them. The ability to create ad groups, and have the plugin cycle through these. The ability to weight ads inside of these ad groups, so some are shown more often than others. Great if you’re trying to give additional exposure to certain products. The ability to show different ads based on the visitor’s location. Great for tailoring ads to specific countries / regions. Split testing of ads and ad groups. This won’t be a great fit for all websites, but I wanted to list it here because it’s been so useful for me personally. Click here to view Advanced Ads Pro! It’s simple to make sales pages look great, and includes tons of drag-and-drop elements that are highly customizable. Built in split-testing functionality makes it easy to improve and optimize sales and landing pages over time. There are plenty of templates built into it, to get you up and going quickly. That being said, I also used one of their main competitors, LeadPages, and enjoyed that on about a similar level. It’s perhaps a bit more versatile than OptimizePress depending on your use case, but if you’re just looking for something to utilize within WordPress, OptimizePress is a fantastic choice. Additionally, OptimizePress is just a one-time fee, whereas Leadpages will bill you monthly. Click here to view OptimizePress! Hotjar is heatmapping software, that is used to create visual heatmaps of where people click and move their mouse on your pages. This data can be used to identify areas that are getting a lot of attention (or none at all) and help you optimize your pages accordingly. It’s a great resource for eCommerce sites in particular, as well as those relying on any sort of sales or landing pages to bring in revenue. Click here to view Hotjar! All live chat support is handled through Tawk.to, due to its large amount of features, and its incredibly low price of $0. There are better live chat solutions available, but Tawk.to is free and makes delivering awesome customer support as easy as possible – which, you know, is kind of the point of a live chat service. Click here to view Tawk.to! Content upgrades on my site are powered by the plugin, ‘Content Upgrades Pro.’ If you’re unfamiliar with content upgrades, they’re essentially an extra bonus, usually tied to a specific article, that you give readers in exchange for opt-ing into your email newsletter. Content upgrades pro helps with his by making it easy to embed these into your posts, complete with opt-in boxes that pop-up upon clicking. It also helps you manage all of your content upgrades in one place, and syncs flawlessly with most email marketing providers, including GetResponse. Finally, a nice analytics section allow you to easily see what content upgrades are performing well, and which ones perhaps are worth swapping out. My only downside is the customer service for this plugin is terrible – as in it’s completely non-existent. The few times I’ve needed to contact support, I’ve gotten no reply, even after following up with them. Click here to view Content Upgrades Pro! OptinMonster is perhaps my favorite plugin for boosting email signups, and I primarily use it for it’s pop-up feature. Pop-ups do work when they’re done correctly, and OptinMonster makes this easy. The forms look great, are easy to customize, and the built in split-testing features work flawlessly. Additionally, you can get extremely specific with what triggers the pop-ups. For example, I may trigger different pop-ups, with different lead-magnets depending on the category of the site the visitor is on, how long they’ve been on the site, what traffic source they came from, their country, etc. It can get very complex! Currently, other than pop-ups that are targeted for specific visitors like that, I have my pop-ups set to appear when the visitor is about to exit the page – click the back button, or the ‘X’ in their browser. Because of the detailed analytics and split-testing feature, I’m able to optimize everything over time, which has led to steadily increasing opt-in rates! Click here to view OptinMonster! This software is pretty powerful, and like many others on this page so far, I’m definitely not using it to its full capabilities. Primarily, I utilize Ninja Outreach to pre-fill templates when appropriate, know when people I’ve emailed have opened emails (and clicked on the links within them), and send out follow-up emails. I also segment contacts based on where they’re at in the outreach cycle – things like not contacted yet, contacted with no response, declined my proposal, negotiating, deal in progress, etc. However, I do not automate the sending of emails like others do, and still prefer to review everything manually prior to sending. Still, the functionality is there. Click here to view Ninja Outreach! Tailwind is responsible for 95% of my Pinterest and Instagram scheduling and management. Their platform makes it very easy to schedule out posts at optimal times, and post them automatically to both platforms. I’m also particularly fond of Tailwind’s hashtag suggestion tool, which has helped to generate tags I wouldn’t have thought of on my own. You’re also able to save your own lists of hashtags as well, to add to your posts with the click of a button. If you’re serious about either platform, this will really speed up the process of publishing quality content on the platforms. Click here to view Tailwind! For the 5% Tailwind is not capable of, my companies utilize Planoly. Currently, this is only multi-image posts, which Tailwind does not seem able to schedule yet. It has many of the same features as Tailwind, but I still prefer Tailwind over Planoly for the majority of posting because of its smart schedule feature, hashtag suggestions, and easy cross-posting to Pinterest. Click here to view Planoly! For Facebook and Twitter, I use and recommend HootSuite Pro. HootSuite Pro (as well as the regular addition of HootSuite) helps with overall social media management for these two platforms, allowing you to autoschedule posts well in advance. Additionally, you can set up ‘streams’ to monitor discussions going on in various parts of the two sites in real-time. For example, I may have a Twitter steam open to look at blogging discussions, internet marketing tweets, and tweets about eCommerce all at the same time. It’s nice, because you can quickly browse discussions to jump into as they happen. Click here to visit HootSuite’s website! Finally, to close out this section, I recommend SEMRush for anybody who wants to invest a bit of money into improving their overall SEO strategy. The ability to monitor the keywords your site (and competitors’ sites) rank for, and how these rankings change over time. The ability to be notified whenever your brand or website is mentioned somewhere else on the web. Keyword research – volume, analytics, and how difficult it would be to rank for. Notifications of SEO issues that may pose a problem to your ranking. Content analysis, and SEO improvement suggestions on an article-by-article level. There are far more available, and more are being added all the time. The price is a bit steep at $99 / month, but if your site is a bit established and improvements in SEO will cover the cost, it’s well worth it. Click here to view SEMRush, who is currently offering a 7-day free trial! Next, let’s move into the equipment and software I use to manage all of the video and audio content that I produce. Unless I’m traveling, I currently use the Shure SM7B for my audio. It requires an audio interface to run, as well as a gain booster (such as the Cloudlifter CL-1) to bring the audio up to acceptable levels (since it requires so much power to run.) These two things together bring the price up to about $570. Much cheaper options include, the Rode Podcaster, Blue Yeti, and Blue Snowball. They come in at about $229, $100, and $50 respectively, and do not require an audio interface. As previously mentioned, the Shure SM7B requires an audio interface to run properly. An audio interface is a hardware device that improves the audio capabilities of the computer, and allow you to connect XLR microphones (and other audio devices) to it. The 6i6 is also overkill, especially for marketers. I only have it because I also use it for music production. For normal audio content, I recommend the much cheaper 2i2 offered by the same company. Click here to view the Scarlett 6i6. Click here to view the Scarlett 2i2. The SM7B is a heavy beast, and it took me 3 microphone stands to find one that can hold it without tipping over. I’m not sure if this is the best microphone stand on the market for the price, but it works great with the SM7B and makes it easy to put it in any position I could ever want. Currently, I use the Logitech BRIO HD webcam to record my videos. It is more than enough for 99% of people doing talking-head videos in a non-professional setting. It records in 1080p flawlessly and the video quality is great. I have no problem taking it with me when I travel and overall, I’m very happy with it. This webcam also records 4k video, but is a bit choppier than what I’d like. Because 4K isn’t a huge priority for me right now, I’ve opted to record at the much smoother 1080p instead. The Logitech C920 is a cheaper alternative that I’ve also enjoyed in the past! A good camera with great lighting will always look nicer than a great camera with poor lighting. A simple light kit can do wonders to improve your video quality and overall makes your videos appear a lot more professional. While I’d typically recommend improving audio before improving video, getting a lighting kit is the obvious next step. This cheap light kit from Limostudio is a great investment if you plan to do a lot of video in the near future! For hosting video that’s only meant to be accessed by certain groups of people (usually customers), I use Vimeo Pro. Vimeo Pro allows me to restrict video to only be playable on my own domain, customize the playback options, and overall, allows me to make the videos appear exactly the way I want them on my pages. Click here to learn more about Vimeo Pro! Adobe’s bundle of software is an incredibly powerful if you work with digital media, and Adobe CC allows you to use all of it for a monthly subscription of $50 / month. Adobe Premiere CC, for editing video. Adobe Photoshop and Illustrator, for graphics editing / creation. Adobe Acrobat, for working with PDFs. The bundle comes with plenty of other software as well, but I don’t use it enough to comment on. Cheaper alternatives include Vegas movie studio for video, Audacity for audio, and GIMP for photo editing. Click here to view Adobe CC! Education is something I still invest very heavily in, as I believe it gives a higher ROI than anything else available for purchase. I spend as much time as possible each month consuming new information, and thinking about how I can use that to build my businesses and improve my life. Feedly is an RSS reader, meaning it can read the RSS feeds of all websites that offer one. Fortunately, most blogs do by default. This means that Feedly can pull all feeds into one dashboard, letting me know when new articles have been published on all of the websites that I’m subscribed to. Additionally, it will display the name of the article, and an excerpt from it. Certain sites may display the article in its entirety, all from within Feedly. Additionally, you can segment feeds into groups or topics, and organize them any way you like. Needless to say, this saves a ton of time each week and allows me to quickly find the articles I’m actually interested in reading, without having to check a ton of websites out each week. Click here to visit Feedly’s website! Pocket Casts is my podcast player of choice, as it improves in many ways over the default podcast player that comes with iPhones. Additionally, their web player is so much easier to use than iTunes, and includes numerous other features – my favorite being playback speed control. The two apps sync flawlessly with each other and it’s just overall, a better solution in every way over the default apps. I’m not sure if it’s the best podcast player around, but it’s definitely loved by podcast enthusiasts. As it has everything I want out of a podcast app, I have no reason to switch at this moment! Click here to visit Pocket Casts’ website! I love audiobooks, which makes an Audible subscription well-worth it for me. Currently, I’m signed up to their 2 credit / month plan, but still buy extra credits if I’m able to go through the books quick enough to warrant more. Audiobooks are great because you can listen to them while you do other things, such as driving, exercising, or even playing video games. It completely eliminates the ‘I don’t have time to read’ excuse and there truly is a fantastic selection of books to choose from each month. Click here to visit Audible and get 2 free audiobooks! For courses on popular topics, I recommend Udemy, as the prices are unbeatable – the site runs $10 sales all the time. Udemy really shines with courses on these massively large topics, that have a very large base of potential buyers. This is because it’s a marketplace, which makes it inherently competitive – top instructors make up a bulk of the revenue, so top instructors try hard to make their courses the very best. I’ve felt quite guilty for paying only $10 for many of them! That being said, Udemy isn’t always the best place for more specialized courses, that may have a lower buyer pool. This is because it’s not really worth it for instructors to make great courses there when they only make $5 a student. Udemy also has a lot of other restrictions for instructors, which is why I’ve chosen not to make Udemy the primary home for my courses. Click here to visit Udemy’s website! I periodically go back through my own courses to reinforce all of the information and think about it in new ways. This also gives me an opportunity to see if anything has become outdated, and immediately update the course accordingly. Additionally, going back through my courses allows me to spark up ideas for new lectures that I may not have thought about the first time around. Consider going back through the content you’ve put out – you can truly learn a lot from it! Click here to view my courses! Finally, let’s look over some tools that don’t quite fit into any of the other sections! You probably already know what Microsoft Word, PowerPoint, and Excel are. The reason I pay for a subscription to these is that they are much more powerful than their free counter-parts. Especially Excel. Click here to view Microsoft Office Suite! Sometimes when power isn’t an issue and I need to collaborate on documents with multiple people, I use Google Drive, and Google’s set of office tools. These have the added benefit of being automatically stored in the cloud and accessible from anywhere. Click here to view Google Drive! Files that are shared between team members are done so primarily through Dropbox. We have the business addition, which has 3 terabytes of cloud storage. Once uploaded to Dropbox, the items are automatically downloaded on other team member’s PCs for immediate access. As so much of my team is working remotely, it is a core part of my business and I wouldn’t be able to function without it! Click here to view Dropbox! Similar to the way I use Google Drive, my team and I occasionally use Canva for quick graphics work, as long as the work is simple. Canva is not nearly as powerful as Photoshop, but it’s quick and easy to use, and for small graphics, it’s more than enough! Click here to view Canva! As entrepreneurs and business owners, it’s very important to practice proper password security. Lastpass allows you to quickly generate random, secure passwords for each website you use, and autofill these passwords into the proper forms as needed. Not only does it save a lot of time typing in passwords, but it’s a much more secure way to store them. Because passwords are not reused, you won’t have to change all of your passwords in the event one website you’re signed up to has a data breach. Best of all, the free plan will work for most people! Click here to view Lastpass! Finally, Bench Accounting handles most of the bookkeeping work for my companies. Because our accounting needs are not particularly complex, Bench is able to handle everything with ease and take the headaches of this off of my mind. Statements are imported and organized automatically whenever possible and I’ve only needed to get on a call with them once every few months. In the meantime, they take care of everything you’d want out of a bookkeeper – categorizing your transactions, preparing reports and financial documents, as well as tax documents at the end of the year. Having your books in order is very important as your business grows, and their pricing structure is set up to fit with the size of your business. If you want to outsource your bookkeeping to a team of professionals, I highly recommend checking them out! Click here to view Bench Accounting! I hope you have found this list of tools and resources helpful. Remember, these are only tools I’m actually using at this very moment, and may not be a complete list of everything I’ve tried and recommend. Additionally, this list will be updated over time as the tools and resources I use change. Going forward, I will archive everything I’m no longer using, when these changes do occur. If there are any questions that I can answer for you about any of the things mentioned within this guide, please don’t hesitate to get in touch.